Guest Post: Hi, My Name Is Jason. Jason is one of those kind of guys who my old youth pastor would describe as “solid” – an all around good man, compassionate, joyful and firm on a foundation of Christ and who He is. 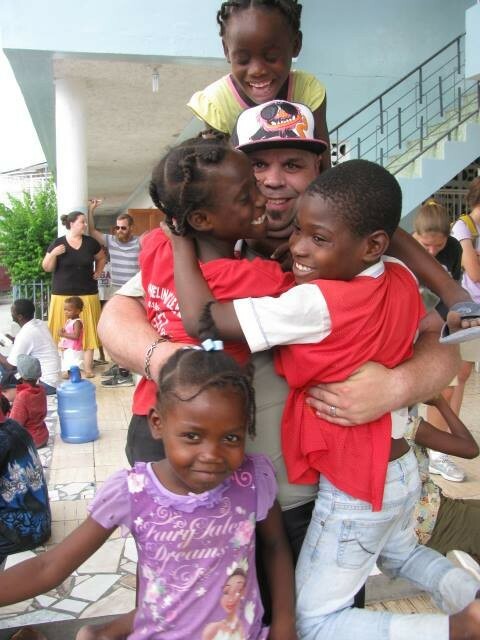 He’s been with joining with PPM since 2011, taking trips to Haiti each year. The relationships he and his family have with our staff both seasonal and full-time, our pastors and community children are awesome to see. These relationships were formed out of a long-term commitment to return to Haiti each year. A commitment that Jason takes seriously. I’d only heard of the mysterious Jason Clark before this year, when I got to lead his team in Carrefour. The stories of past trips he told and the excitement he and his family held for their time in country was contagious. Jason, thanks for your complete good-heartedness. Thanks for exposing your children to a world-view so young. Thanks for being dedicated to the ministry and calling God has for you, both in the USA and abroad. 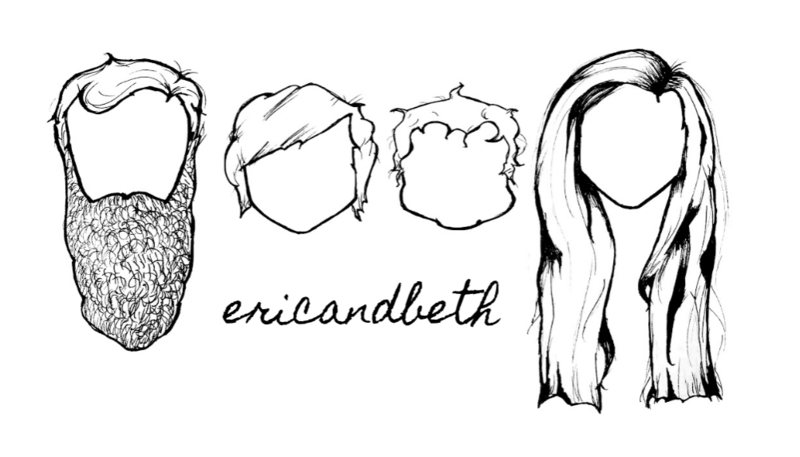 And thanks for sharing such a wonderful and beautiful piece of your heart with us. Hi, my name is Jason. One day when I was driving home from work, I heard God tell me to “go”. A simple command and I didn’t even know where I was supposed to go to. 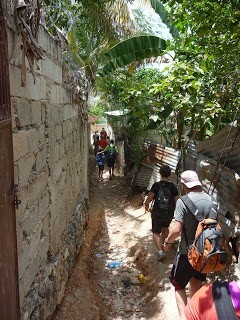 A couple of weeks later, I found out our church was going on its first mission trip…to Haiti. Nothing has been the same since. Our first trip was in June of 2011 and now my wife and I lead the trip for our church each summer. A lot of people want to know “Why Haiti?” Besides the obvious, that God chose me for Haiti, I wrote the following to try to explain. This was written after our 2012 trip working on the church at Mariani. It’s early, but the streets are busy and the air is already sweltering. 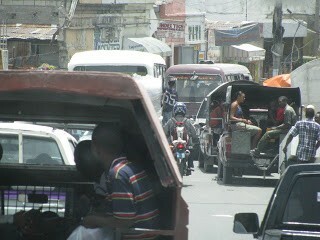 Leaving behind the bustling highway, the traffic turns from trucks, buses and tap-taps to motorcycle taxis. The pavement quickly turns to dirt and the small shops and street vendors turn to humble homes made from concrete blocks. The trek is uphill and difficult. Just when it feels like we can’t go on, our translator tells us to stop so that our team can regroup. 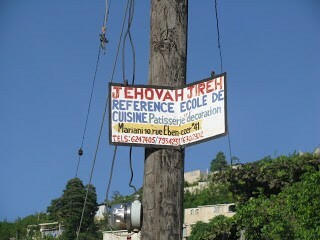 The sign on the electric pole in the small flat area proclaims, “Jehovah Jireh”—God will provide. We continue down a dirt path between concrete walls with doors and gates made of tin or other scraps of metal. I wonder about the people living behind the walls. I think about how I will be back at home in a few days and they will still be here. We pass through a narrow gate into a small clearing. On my left, there is an area covered with canvas that serves as a church sanctuary and is also a sanctuary from the relentless sun. I see a little girl. Her shoes are too big and she has wrapped the laces around her ankles to keep them on. Her shirt is a pajama top. As she sees me, her face lights up with a smile. I forget about the heat and remember why I am here. The church we have come to build is important and the work is rewarding, but that is secondary to the relationships that are built in our short time here. The building will serve the community of Mariani for decades, but the friendships are eternal. As we wind through the streets of Port-au-Prince en route to the Toussaint Louverture airport, I marvel at the scene passing by through the window of an old school bus. It seems impossible that I will be home to sleep in my own bed before the day passes. It is unfathomable that we are only 700 miles, less than a 2 hour flight, from the richest city in the United States. I am once again watching through a window as the jet accelerates down the runway and begins to ascend. I see the blue tarps and rusty metal roofs as we bank and the pilot sets our course. I already know I will be back, but I also know it won’t be soon enough. 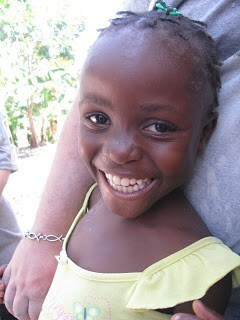 How could I not return after seeing the need and experiencing love and hope that defies the odds and survives here? I reflect on the events of the week and wonder why I was born in a land of prosperity when so many of my Haitian friends deserve it much more than I do. The images and smells are burned into my brain. This is not a place that I can come to for one week out of the year and then go on with my life while I am away. God has shown me a place that I did not know existed until I saw news photos of death and destruction from a massive earthquake. A place that now weighs heavy in every decision I make…a place that is now defining my existence. If you want to read further about Jason and his church’s trip this year, check out their trip journal.